Renowned as one of the finest fisheries in Ireland, the Ballynahinch Catchment drains an area of 68 square miles and is a diverse system of interconnected loughs and rivers, drained by the Ballynahinch River and offering the very best of fly fishing in Ireland. This majestic river, with fishing rights owned exclusively by the Ballynahinch Estate, winds its way underneath the Castle for three kilometres until it reaches the wild Atlantic Ocean at Bertraghboy Bay, Connemara Ireland. 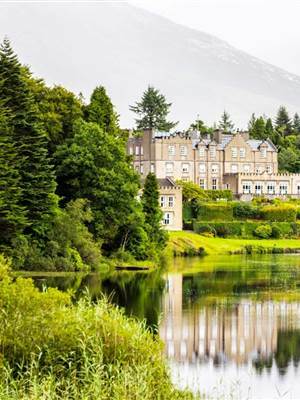 All salmon and sea trout entering this magnificent system must swim up this river through the Ballynahinch Castle Hotel Estate giving Ballynahinch its world-renowned reputation as a famous salmon and sea trout fishery making it the ideal place for fishing weekend. The season officially opens on 1st February and extends to the 30th September. The effective season, however, begins with a small run of large spring salmon, averaging 10lbs, during the month of May. Ballynahinch is, however, traditionally a summer fishery. The main run of grilse (salmon that have been at sea for one winter) appears in early June with fresh fish continuing to turn up until the last day of the season. The Ballynahinch grilse are traditionally very large, by Irish standards, averaging 5-7lbs with grilse up to 8lbs being caught late in the season. The closure of the Irish drift net fishery in 2007 has had a profound impact on the stocks at Ballynahinch with the run of salmon doubling in the first year following the closure. The average size of salmon has also increased given that the larger fish were being taken by the nets as they returned to the coast. Killeen Lake, on the hotel grounds, is our stocked rainbow trout fishery, with fish averaging 2lbs. Fished from a boat and with one of our experienced guides, this is a very exciting and rewarding morning’s fishing; particularly for the novice angler. 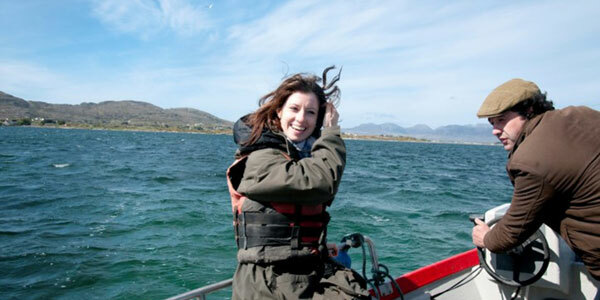 The Killeen Lake season extends from mid April to August. Ballynahinch was a celebrated fishery for its colossal catches of sea trout. During the nineties and up to 2004 the stocks of these stunningly energetic fish were seriously damaged by local salmon aquaculture and its attendant parasites. Since the downsizing of the salmon farm in the estuary, the stocks have bounced back, and the fishery is on the road to being one of the premier sea trout fisheries again. The best time for sea trout fishing breaks is from early June until mid-July. 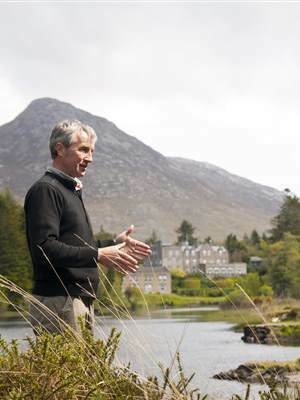 Enjoy the very finest fly fishing holiday that Ireland has to offer within Ballynahinch Castle Hotel Estate Connemara Ireland.